The Whitsuntide treat was an eagerly anticipated event. Stinchcombe Band was booked for a charge of £7. The usual order of service was agreed; Service in church at 1.40 and sing two hymns “The Church’s Own Foundation” and “Brightly Gleams our Banner” and to sing “Onward Christian Soldiers” at The Butts coming back. A committee was to arrange the boys’ sports and there would be a maypole and swings. Later years mention a sweet stall at at the Rectory and teas. The funds of the garden fete were to be divided between the choir outing and the Rectory dilapidation fund. Alongside the routine business were concerns about the choir. The choir was in a very bad state and a lot of complaints had been made from the congregation … since the girls had left it was a difficult matter to get boys to fill the place. The outcome was that the choirmaster was changed. Mr Clutterbuck was appointed, new robes were ordered, and improvement was expected. The unhealthy state of the Sunday School lavatories also caused concern and it was agreed that urgent action was needed. The choir and members of the Church would be going on the tower on Whit-Sunday morning to sing a few hymns after the 8 O’Clock Communion. It was proposed to have a fancy dress parade with prizes at the Sunday School treat. The conditions were that no dresses should cost more that a shilling. 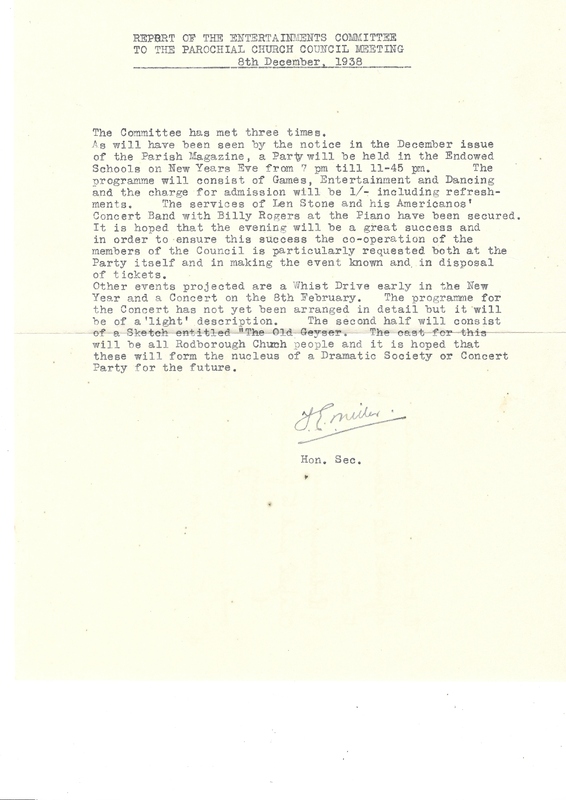 Bad weather on Whit-Sunday meant that Stinchcombe Band was cancelled at the last minute and had to be reimbursed £1 and 5 shillings for the hire of a car that was too late to cancel. Five shillings was paid for the use of the wireless which was fixed by Arthur & Jack Pritchard. The church clock was in need of expensive repair and as it was of use to everybody in the parish an appeal made to the Rodborough people and the money was quickly raised. Very quickly it was confirmed that the Rev. L.V Miller had been appointed and that he is exactly the man who will fulfil the terms of our resolution. Rev. 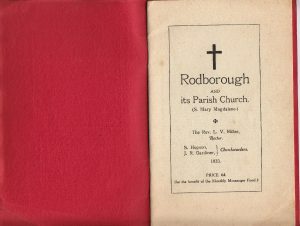 Waring had officiated for 36 years at Rodborough and preparations were made for a presentation fund. At the Whit-Sunday parade it was agreed to sing one hymn outside the church and one outside the Prince Albert – the same hymns being used each year. The newly appointed Rev. Miller presided over the first meeting. A monthly parish leaflet was to be delivered around the parish. it would be sponsored by advertising and very quickly became a magazine. 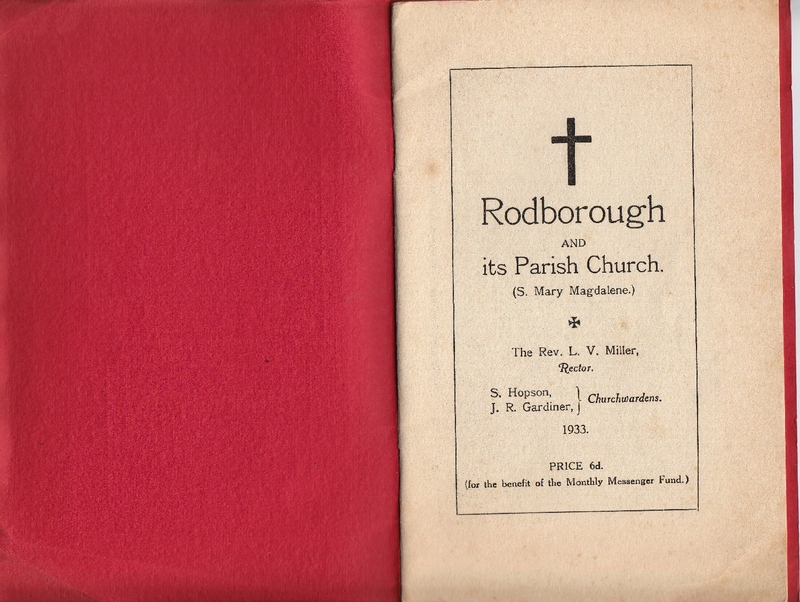 The rector also produced a booklet on Rodborough to be sold for 6d. Electric lighting was to installed in the church. The contract was to be given to Mr F. Harper at an estimated cost of £76. 15s. A churchyard water supply was installed at a cost of £5, and the choir stalls were repaired. A churchyard seat – presumably the first, was purchased and it was noted the benefit and convenience it afforded. Reference was made by the rector to providing a a district nurse for the parish but it was left for future discussion. An offer of a “right of way” over an adjoining property from the north gate of the churchyard to the Bath Rd was received from Mr North, but it was decided that the Church Council was not in position to accept the offer and the resulting responsibilities. The choirboys were to be given a gratuity of 5 shillings per quarter. It was noted that recordings of the the positions and numbers of graves had been seriously neglected, showing some discrepancies in numbering and omissions of entries. It was resolved to purchase number plates for the identification of green graves. The system of placing names on pew ends was removed. A new stained glass window given by Mr & the late Mrs Steel was to be installed in the Vestry which would become the Lady Chapel. It was proposed to move the war memorial to the same location (This did not happen). Insurance against damage from aircraft was to investigated. The vestry was to be moved to its current (2019) location in the NW corner of the church and Mr Payne of Amberley was preparing sketches for the new window in the new Lady Chapel. Plans for the furnishing of the Lady Chapel were submitted by Mr Burke-Downing FSA. A fire at the New Year’s Eve social event at the Endowed School damaged the clothing of nine people, thankfully there is no suggestion that anyone was hurt. “Len Stone and his Americanos with Billy Rogers at the piano” played. In February a request for help was received from Stroud Urban Committee regarding the problem of refugee Jewish children from the continent. Further information was deemed to be required. 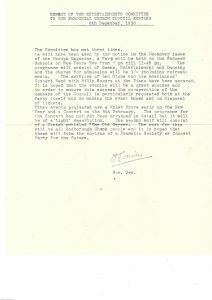 In May a representative was requested to serve on the local committee of the Soldiers, Sailors and Airmen’s Families Assistance whose work was most important in wartime. September: “As the blackout has become an integral part of our daily life, the Rector announced that something must be done at once as regards evensong on Sundays: they could either black out the church windows or change the time of the service: he suggested the latter alternative as more convenient from the point of view of the congregation, as walking in pitch darkness was not pleasant …” After some discussion agreed to hold evening service at 3.30pm . The new Lady Chapel was dedicated on 3rd December. A knitting sqaud was to provide comforts for the Navy and marine services. A special afternoon Armistice Sunday service was held for all the volunteer war personnel of the parish. The church made arrangement to have its own fire-watching squad. In December the rector announced that he felt it his duty to try and get some real war time occupation and he had been accepted for a Naval Chaplaincy. Rev. Arthur C. Elliott was the Priest-in-charge. The problem of the churchyard becoming a playground for children led to the north gate leading to Spillmans Rd at 4pm. It was decided to discontinue the children’s procession on Whit-Sunday afternoon, but to revive the singing on the tower. In February the imminent transfer of Rev. Elliott to a living at Saul & Whitminster provoked a crisis whereby unless a successor was appointed both churchwardens would not seek re-election and services would have to suspended. In April Rev. 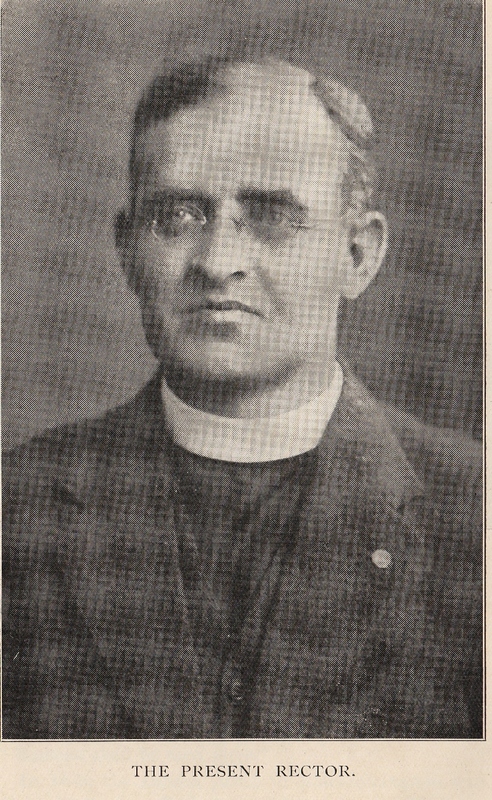 G.E Hubbard agreed to undertake the charge of the parish, but by October had been replaced by Rev. J Nankivell, who commented on the sorry condition of the churchyard and promised to see the Labour Exchange to try to get a suitable man to do the cleaning up. Rev. Nankivell’s duties ended in April and the Rev. Miller caused some surprise by his presence at the AGM in April. This minute book ends in April 1945. Continuing from the next volume. Rev. Miller returned to the Naval services after one month’s leave and he finally released from the Navy at the beginning of August. The planned date for the unveiling of the war memorial was 1st June. The Rev L.V Miller tendered his resignation after 21 years in the parish.